Genika Trigger was designed for long run acquisition. 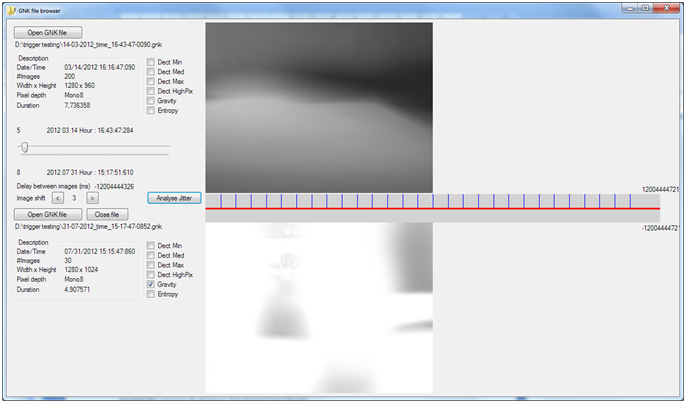 Its unique on the fly image analysis capability to decide if a picture should be saved on disk makes Genika Trigger the perfect choice for long time process analysis and imaging. Nevertheless long run acquisition can be interrupted by several issues such as a PC crash, power loss or hardware failure. When using standard video file format such as AVI, the whole file may be lost because of a file corruption: those formats require a clean file termination. A work around consist in using a file per image – Genika Trigger does support TiFF – but that causes performance issue when the throughput is very high : Windows has create and close up to several hundreds of files per second. Genika Trigger has information for each frame that may need to be saved such as spatial sampling information, GPS data or the smart trigger that set off image recording. Genika Trigger embeds a GNK file browser that allows access to this information. 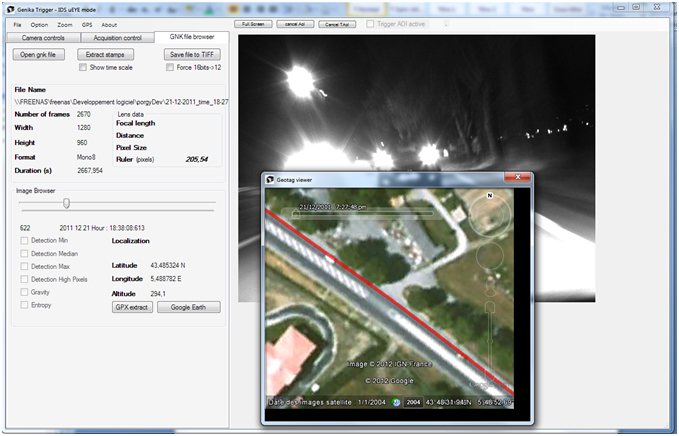 Time stamp can be exported to a TXT file for further analysis, GPS to GPX file and it is possible to open a Google Earth view to see where the image has been shot. A ruler allows direct on screen measurement if the spatial information have been specified. GNK files can be exported to TiFF files, and another browser allows two files to be compared and jitter/delay automatic analysis. That is very useful for multicamera/stereoscopic application.